Denon AH-D7200 review | What Hi-Fi? There’s nothing like the luxury of slipping on a good pair of headphones and disappearing into your music. Sometimes you can put a price on comfort, and the flagship Denon AH-D7200s are an exercise in lush headphone design. They sound good, too. Once you slip the Denon AH-D7200 headphones on, you won’t want to take them off. From the sheepskin leather headband to the real walnut earcups to the elegant aluminium frame – they’re beautifully made. The over-ear, closed back design is surprisingly light, despite having a sturdy, durable build. The wooden earcups come with extremely comfortable memory-foam earpads covered in soft artificial leather. You ears will feel airy and well-cushioned – perfect for long hours of listening. These cans fit all sorts of head sizes and the earcups swivel to get a better fit around your head, too. Not once did we feel the headphones would fall off, either. They’re not too gripping, but stay firmly in place. 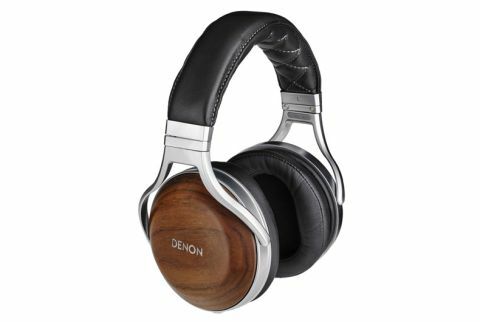 There are other neat touches – such as ball-bearing click stops for the headband adjustments, numbered markings for your preferred setting, the thick, woven cable covering – that show just how much thought and care has gone into designing Denon’s flagship headphones. Unlike the foldable B&W P9s, the Denons aren’t meant to be used as portable headphones. The 6.3mm-ended cable can attest to that. There’s no 3.5mm adapter plug (which is a shame), but you can detach the lead and swap it for other Denon cables that do have in-line controls. But the Denon cans are very much for home use – they’re too big and of too capable to be used with just your smartphone. If you’re not plugging them into your hi-fi system, you’ll need at least a good quality DAC like the Chord Mojo when listening to laptop-based music to really hear them at their best. Denon approached the AH-D7200s more like traditional speakers, with the Denon’s custom-developed 50mm driver inside each can designed to deliver the kind of performance you get from high-end loudspeakers. And sure enough, the Denon headphones have the refinement and spacious performance that you don’t tend to get with more affordable headphones. There are oodles of detail: from the steady thrum of the basslines on Massive Attack’s Angel to the wispy vocals of The Unthanks. Notes stop and start with confidence – although it could be more punctual and punchy. They have an even balance throughout the frequency ranges, with no brightness or boominess sticking out to mar the sound. They sound airy, open and each instrument is placed accurately – it’s a likeable sound. A lack of finesse in the midrange is the only complaint. Vocals are centred and are delivered directly – the cans have an upfront manner that sounds immediate – but we’d like voices to sound more expressive and natural. If you’re looking at a top quality pair of headphones at this price, we’d point you towards the Beyerdynamic T1 gen 2 (£700) – but even that’s not a totally fair comparison, as they’re a semi-open design. The B&W P9 Signature headphones are more apt rivals to the Denon AH-D7200s, with closed-back over-ear designs at the exact same price. And these P9s sound more natural: voices are fully fleshed out and emotive. They do a better job of pulling you into a song. There’s a smoothness to the Denon AH-D7200s’ sound that will leave you listening for hours without getting fatigued. That smoothness does come at the expense of total transparency and punch, but it’s a balance we can imagine many getting along with. Where that balance doesn’t quite work is if you’re listening to songs that demand precision and attack. Any song by Rage Against the Machine or Eminem sounds a touch too soft through the Denon, where it should be packed with attitude. The B&W P9s may have an exuberant low-end, but they handle rhythm and dynamics with greater accuracy and control. They’ve got more punch. And they get across the true intent of a song more faithfully than the Denons. This comes across with John Williams scores, too. Rey’s Theme from Star Wars: The Force Awakens sounds delicate and harmonious through the Denons. But the B&Ws time better, and give you a better sense of the song – it’s more involving. There’s plenty to love about Denon’s mellifluous tone. In fact, you may prefer this balance if you’re after long, comfortable listening sessions. Rivals do offer a more transparent and accurate performance, though, which stops the Denon flagship headphones from reaching full five stars. However, you’d be hard-pressed to find more comfortable headphones of this kind. The Denon headphones are definitely worth auditioning. Try these headphones on – you may not want to take them off any time soon.